Marketing-Works! 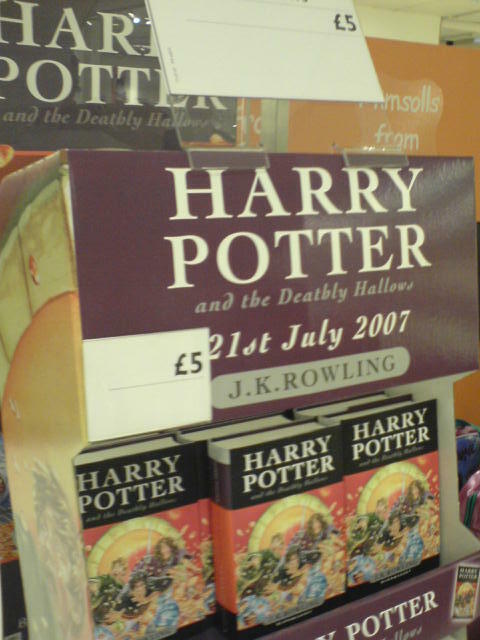 : Harry Potter - has retail marketing gone mad? As almost all those of us on planet earth are probably aware, the last Harry Potter book was just released at midnight on the 20th of July. In the week leading up to the books release, there has been lots of media chatter about this book launch – more than I can remember for some time. I’ve not read the books so I can’t vouch for their brilliance but one thing that is obvious is that the publisher Bloomsbury has lost control of the marketing associated with this launch. Up until the final day, Bloomsbury have been keen to keep the final chapter of this saga under wraps. Embargos and security were used as methods for preventing publication and spoilers have been showing up online for weeks. In other words this is certainly a hot property that everyone was after. Given this, how much discounting do you think would go on during DAY 1 of publication? 10%? 20%? Even before publication, ASDA Walmart were talking up a massive 51% discount in the media that had led to a clash with publisher Bloomsbury (see http://news.bbc.co.uk/1/hi/entertainment/6902031.stm) . Small bookshops were complaining that at such a discount, it was cheaper for them to go to the supermarket to purchase stock than it was to go to the publisher direct. That puts the “cost” of each book at something approaching £9 here in the UK. Imagine my surprise when I got to the shops today and saw even greater discounts on day 1. At WH Smiths they were offering a conditional discount of 61% off the cover price taking the price down to £6.99 – in other words they were almost certainly making a loss (something WH Smiths has specialised in during recent years). Further along in the shopping centre, the department store John Lewis was selling the book for £5 with no conditions. In other words, they were subsidising customers purchases to the tune of almost £4 per book. Given the threat that there was no coverage of this pricing to be seen at the front of the store and that John Lewis doesn’t usually stock books, I really wonder what kind of marketing tactic they thought they were employing? So – Day 1 of a long awaited book release and the discounts are reaching epic proportions of 72% from list price. It’s not great news for Bloomsbury – I saw people purchasing multiple copies of the book and they are already showing up on ebay at inflated prices. Is it any good for the retailers? Well unless they are bringing in substantial new customers to their shops, one would assume it is not. Whilst Asda may have benefited from some early publicity, I doubt that the other retailers actually got the message out to consumers to tell them that they were going to offer even more generous subsidies discounts. My take – the “me too” retailers were daft. In terms of marks out of 10, Asda get 7/10 because they let people know they were going to sell at cost, WH Smiths get 5/10 because at least their offer probably ensured a profitable transaction because of their use of link savings. John Lewis get 1/10 – a real stinker. Offer a book that you wouldn’t normally sell WAY below cost and then forget to tell people that you are doing this “one off” special. In other words – if you were going to buy this book elsewhere, why not get it from us and have some free money. It’s not going to build any loyalty and almost certain to lose them money. Poor.